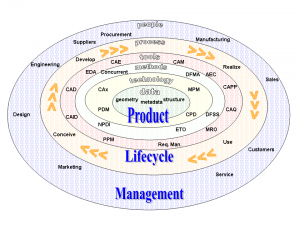 PLM stands for Product Lifecycle Management, and if you wonder what it is, let me tell you that PLM is what you and your company do everyday to manage products through the their lifecycles. A lifecycle starts from Creation/development, passing through production/sales and ends up in the Product/service Obsolescence. Of course there are many stages between. And how efficient you are in those will give you a competitive advantage among your competitors. Are you dominating your market or competing? Get help and advise among the different product lifecycle management stages, regardless if you get support from us, get help! that could make the difference between win or die in the market arena.